I tend to favour a cream cleanser in the mornings and oil for the evening when I have to remove the daily grime and makeup. I've been using the Acure Organics Sensitive Facial Cleanser since July. It's a nice creamy texture, pleasant aroma and leaves my skin feeling soft and clean. Oil cleansers are a staple for me and I've been enjoying using the Siskyn Skincare Oils Camellia & Safflower Hot Cloth Cleansing Oil. It's fragrance free and has a nice blend of ingredients for sensitive skin. I've recently add Ihana Skincare Beri-Activ Cleansing Cream to my collection. I previously purchased a sample and first impressions were good so I wanted to test it over a longer period of time. It's a blend of seven antioxidant rich Arctic Berry Oils and extracts plus certified organic. I love to use toners but I had to ditch all my old favourites because they contained linalool. Most of the time I would use Manuka Floral Water but it's been a bit tricky finding a decent supplier. I've reviewed the Evolve Organic Beauty Daily Defence Moisture Mist in full back in June and I think it's a fabulous product. I feel like I put moisture back into my skin when using this toner, it never feels drying or stripping. My moisturisers are both new to me and I'm trialing them for review. The Acure cleanser has left a lasting impression so I wanted to explore more from the range and the Day Cream seems like a good fit. I found Scienea Superberry Serum Repair & Restore via the Free From Skincare Awards as they were a shortlisted entrant. You all know I adore serums and my favourites are all fragrance free so to find one with aroma but minus a listing for linalool is exciting for me. I use this mainly in the evenings and first impressions are good. Only criticism I have is the ml for ml value is more costly than others I buy. Evolve Organic Beauty Hyaluronic Serum 200 is a really interesting product. It has a gel like texture and works best when paired with a moisturiser layered on top. I still can't make up my mind if it's a worthwhile extra step in my routine. Considering I'm a beauty junkie I'm really slack on pampering treatments. I'm so forgetful, short of time or just lazy about this extra step. 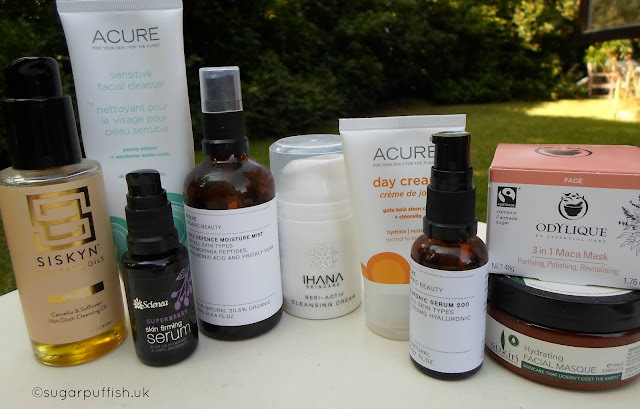 Also I'm comfortable that my routine of cleanse, tone and moisturise satisfies my needs so an extra step so additional products do not feel necessary. I have two masks in my stash - Odylique 3 in 1 Maca Mask and Sukin Hydrating Facial Masque. I've reviewed Odylique in full so I've linked that for you but it's a powder mask which I do enjoy using from time to time. I think it works well for my skin and seem to brighten it when it looks a little dull. On the other hand the Sukin mask is simply a very rich cream (think old fashion cold cream) containing Mango Butter, Avocado, Pineapple Extract and Olive Fruit Extract. I think this one could benefit me most in winter weather as you allow it time to sink in and then wipe off the excess. Only criticism with Sukin creams is that to my nose they have an underlying aroma reminiscent of antiseptic creams, has anyone else notice this? Let me know if you are using any of these products and how you feel about them. I've been using a hyaluronic serum (Jordan Samuel's Hydrate Serum) and think it has made a difference but definitely noticed it more during the Winter months. Nice to read your reviews of the Acure products. They are readily available and relatively inexpensive here in the US but, despite that, I haven't tried that many. Have you ever used the Weleda White Mallow line? Great and no linahool. Both the lotion and the face cream are wonderful, I mostly buy the face cream as a hand cream. You should definitely try these 2 products from Acure I'm really liking them both. I'm not a fan of Weleda so I don't use their products. That's too bad because those Weleda creams are some of the only that don't flare my skin up when I'm having a reaction. I consider the face cream to be in my must-have arsenal for my skin sensitivities (e.g I got sun poisoning last week as a result of a serum that made me photo sensitive, I have ongoing dermatitis on patchs of my hands, etc.) and it was the only thing I could use once I calmed down a bit). I know you have high standards so I imagine you have good reasons for staying away from brands/products you don't like. Thanks again for reviewing the Acure products.